Fig. 1. Photo of George J. Bauer as 17th President of the A.N.A. George Joseph Bauer (1870-1961), was born on September 15, 1870, son of Marcellus Bauer (1841-1914), an Alsatian immigrant trained as a butcher, and Frances Egerer Bauer (1850-1936), a native of New York born of a father from Bavaria and a mother from Prussia. In 1875, his parents took in two Alsatian immigrants as boarders : Eugene Veltri (1850-), who worked as a clerk in their store, and Christian Holuver (1853-), who worked as a butcher. Bauer was a life-long resident of Rochester, New York. He is especially noted as being one of the foremost authorities on ancient Greek and Roman coins and for owning one of the best collections in the world. From birth he inherited a rich European cultural background and a love of ancient Greek and Roman numismatics connected to that world. Since the 1870’s, Rochester, New York is ranked 7thamong the most active cities in America in the field of numismatics, home of Henry Augustus Ward’s famous Ward’s Museum. According to his various published biographical sketches he began coin collecting at age 12 years old, i.e., in 1882 when he was a student at St. Joseph’s Catholic School. As a teenager he published priced coin lists as early as 1887 advertising in The Curiosity World, and consequently, together with Richard R. Gay, who was dealing since at least 1884 , and H. Brayer partner with George F. Wolf, Manager of the Rochester Coin Company in 1888, and George C. Vogt, dealing in 1888, they are to be counted among the earliest known coin dealers in the city of Rochester. Vogt was a neighbor of Bauer and lived at 101 Front Street just down the block from him. Bauer worked with his father at his butcher shop called Marcellus & Son, 73 Front Street, Rochester, New York, specializing in sausages, though he was actively coin collecting and dealing on the side. But stamp dealers were the earlier group in Rochester during the 1870's including Richard R. Gay, James Vick, Carlos Montrail, and R. M. Weston. In September 1888, he attended the International Fair and Exposition held at Buffalo from September 4th to 14th, and was awarded first prize for his collection of ancient coins being given the copper medal “Awarded by the Buffalo International Fair and Exposition, 1888”. The 1889-1890,City Directory of Rochester, New York listed young George as a coin dealer at 73 Front Street. In 1889 he had business envelopes and letterhead printed with the caption GEORGE J. BAUER, DEALER IN COINS, MEDALS, AND TOKENS, 73 Front Street, Rochester, N. Y. for his coin dealership illustrated with a very rare Roman AE Dupondius, Moesia, Viminacium (238-244 A.D.) [PM 01-39-01] Obverse : Beaded round frame. Legend : IMP-GORDIANVS-PIVS-FEL-AVG, Device : Draped cuirassed bust portrait facing right of Emperor Gordianus III with radiate crown. Reverse : Beaded round frame. Legend : PMS_C_O_LVIM. Device : Moesia standing chiastic pose towards left holding in her left hand a vexillum marked VII and with her right one marked IIII flanked by a bull on the left and lion to her right. Date AN IIII in exergue. (Regnal year IIII). Fig. 2. 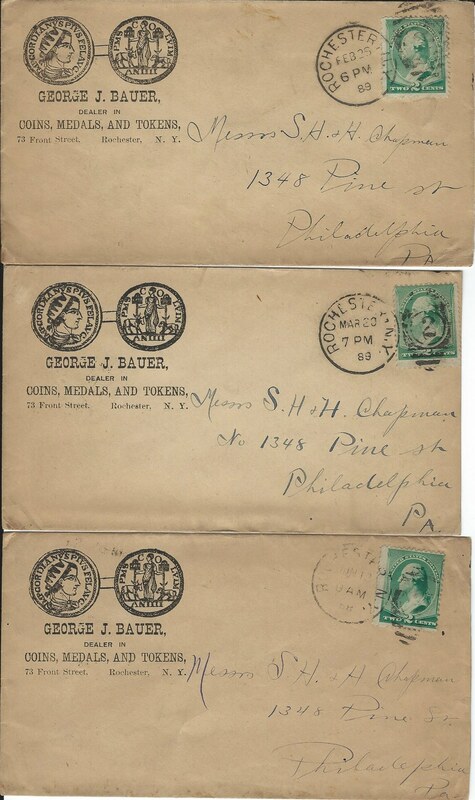 A few of the many letters sent by Bauer to the Chapman Brothers in 1889. Courtesy of the Lupia Numismatic Library, Special Collection, Chapman Family Archive. He joined the ANA in April 1892, and given member no. 93 (See The Numismatist, May (1892) : 77). He published his first half page advertisement in The Numismatist in May 1892 on page 85 selling U. S. and foreign coins, tokens, medals, and paper money. In 1899 after the ANA reorganization he was given ANA member no. 55. His ANA membership lapsed for many years. He rejoined the ANA in 1911 and given member No. 1450. As a coin dealer he ran ads in earliest issues of The Numismatist, Vol. VII, No. 1, January (1894) : end paper ad after page 16; advertisement selling ancient Greek and Roman coins in The Numismatist, August (1895) : verso first leaf; listed as a paid subscriber to The Numismatist, Vol. X, No. 2, February (1897) : 44. His various known addresses are as follows : from 1870-1910, 73 Front Street, Rochester, New York; from 1911 to about 1919, 192 St. Paul Street, P. O. Box 302, Rochester, NY; from about 1920-1961, 1462 Culver Road, Rochester, New York. He married on September 9, 1891, Julia L. Fischer (1871-1951), a native of New York, her father Thomas Fischer (1844-1916) was from Bavaria and her mother Josephine Guhman (1846-1932), was born in Massachusetts. The couple had three sons Clement Marcellus (1895-1985), Francis Joseph (1901-1992), and Edward George (1905-1992). He attended the Syracuse Athletic Association, Memorial Day Meet, May 30, 1896 running in the Two-Mile Handicap, taking third place in the 90-yard dash. It is variably reported that he founded the Genesee Motor Vehicle Company, corner of Court Street and 112 Exchange Street, Rochester, New York in either 1904, 1905 or 1906. Perhaps a clue to the actual date is to be found in his seed money. It seems highly tenable that just before his establishment of the Genesee Motor Vehicle Company we find him selling his coins through Ben Green of Chicago : Fifteenth Mail Auction Sale Catalogue of the Coins, Paper Money, Etc., of Geo. J. Bauer, Rochester, N. Y. and others. 651 lots. Distribution Sale on April 8th (1905) by Ben G. Green, 1533 Masonic Temple, Chicago, Illinois. (Adams C- "Weak") Consequently he would have had sufficient funds to start his business sometime thereafter. Genesee Motor Vehicle Company was listed as an agent to sell Corbin cars in The Horseless Age, Vol. 17. No. 3, January 17, 1906, and Motor Way, Vol. XIV, No. 3, January 18, 1906. One of the earliest articles on the Genesee Motor Vehicle Company of Rochester was about the electric car built there that drove from Rochester to Buffalo published in The Automobile, Vol. XV, No. 8, Thursday, August 23, 1906. Apparently the company must have begun no earlier than late spring and no later than the winter 1905. Regardless, in February, 1910, he raced car No. 16 at a “Smoker” in Syracuse, New York. In 1911, he moved Genesee Motors to St. Paul Street, near Franklin, where he remained until retirement in 1940. In 1917, he became the first franchised Ford Motor agent-dealer in Rochester, New York. In the 1920 U.S. Census the two eldest sons worked as salesmen for their father, a retail merchant of automobiles. At the 188th meeting of the Rochester Numismatic Association held on April 20, 1920, he ran the auction of 105 medals. On January 4, 1912, George J. Bauer, together with Dr. George P. French, George A. Gillette, Louis G. Amberg, Harry H. Yawger, Joesph A. Koeb, and nine others met at Hotel Rochester, Main Street, rochester, New York, and founded the Rochester Numismatic Association. Perhaps following the example of the 18th century "Tuesday Club" the newly founded Rochester Numismatic Association (RNA) scheduled their meetings to be held on the first and third Tuesday of every month, except July and August, which was held only once per month. The RNA soon joined the ANA and was recognized as one of the first branches and designated "local branch two". The RNA invited the ANA to hold the annual convention at Rochester. At the February meeting George Bauer exhibited his Chinese money consisting of the usual odd money, i.e., razor, the silver saddle and other oddly shaped figures in gold, silver, brass and bronze. His interest and fascination in Chinese money, no doubt, was from reading about it in several and various articles published in The Numismatist in its first eleven volumes. When he exhibited these odd forms of money Bauer gave amusing and colorful anecdotal stories about how he acquired certain pieces from missionaries who worked in China, and others from various auctions or collectors. In August 1912, forty-seven ANA members arrived for the RNA sponsored ANA annual convention. Attendants at the convention received the RNA convention badge struck by Whitehead & Hoag Company of Newark, New Jersey and designed by the noted engraver and RNA charter member, Joesph A. Koeb, who worked for Bastian Brothers Jewelers of Rochester. He was elected to the Board of Governors of the ANA in 1922, and became Life Member No. 4 at that time. He was elected 17th president 1930-1932 at the ANA Convention at Buffalo. He attended all of the ANA Conventions from 1912 until 1960 except two, when his wife died in 1951 and once when he was seriously ill. He was also a member of the ANS and the Rochester Numismatic Association. He served as the 3rd president of the Rochester Numismatic Association. Sometime between 1922 and 1932 he had Alphonse Anton Kolb (1893-1983) design his 34 mm bronze or nickel store card. On the obverse : bust head of the Sicilian Naiad Nymph of Syracuse Arethousa facing left wearing a pearl necklace framed by four circling dolphins, an idealized version of an ancient Syracusan coin. Reverse legend : GEORGE J. BAUER/NUMISMATIST/ROCHESTER, N. Y./A.N.A./LIFE MEMBER No.4/A.N.S.-R.N.A. He is noted to have many trips to the Mediterranean world with his wife exploring the Middle East and Europe and, of course, looking to acquire rare ancient coins. As it was reported in the February 1925 issue of The Numismatist : “Most collectors are content to gather their coins via the dealer and auction route. Not so with George J. Bauer of Rochester. He prefers to pick them up first hand in their native land.” His speech delivered at the August 23d, 1924 ANA Convention illustrates his travels abroad in search for coins and was published as : “A Real Numismatic “Spree”, The Numismatist, Vol. 37, No. 12, December (1924) : 738-41. During his trips to Egypt from 1922 to 1924 he visited King Tut’s tomb in the Valley of the Kings. He returned to New York aboard the Adriatic on April 11, 1927, from Naples, Italy. Soon after his return he sold some coins together with a few other collectors through a coin auction sale held by Thomas Lindsay Elder, Sale No. 210, July 21, 1927. (Adams C+) He returned to New York aboard the Laurentic on March 6, 1929, from Alexandria, Egypt. Thomas Lindsay Elder, January 18, 1934, also sold at public auction his third coin collection. The Bauer home was a happy home and warm family ties connected them. George and his wife Julia and their sons had lived in his parents home according to the 1910 U. S. Census. They all lived together as one happy family at 73 Front Street until the death of his father Marcellus in 1914. George and Julia got a new house at 772 Culver Road and widow Bauer continued to live with them until her death in 1936. Likewise, his son Edward George Bauer and his wife Geraldine also lived with his parents. The couple had a daughter Nancy Ann Bauer in 1939. In 1949 he received the Henry R. Weisenbeck Memorial Award and Citation as an outstanding amateur collector, student, and teacher in the field of numismatics, from the Rochester Museum Hobby Council. At this time he is listed in the Rochester City Directory as a Numismatist. Beginning in December 1940 Bauer held regular coin auction sales. David Sklow’s, Q. David Bowers Research Library Sale, Part III, October 9, 2010, offered a complete set of the thirty George J. Bauer auction catalogues. On August 19, 1951 Julia L. Fischer Bauer died three weeks before their 60th wedding anniversary. George never held another auction after the death of his wife. On August 17, 1955 he applied for his Social Security Card and is No. 110-28-3410. At this time he retires as a dealer and no longer lists his occupation as a Numismatist in the Rochester City Directory. Edward Gans, Sale No. 15, April 19, 1960, also sold at public auction his fourth coin collection, excluding, of course, those numbered among his 30 coin auctions held by himself as well as those held at the Rochester Numismatic Association meetings. A year later he planned on attending the August 1961 ANA Convention in Atlanta, Georgia. While preparing an exhibition for the Rochester Numismatic Association’s meeting, he fell at his home at 1462 Culver Road, and broke his hip on May 16, 1961. He was rushed to Park Avenue Hospital for an operation to set his hip. He died on Thursday, May 25, 1961 in Park Avenue Hospital, Rochester, New York, from post-operative complications. His funeral Mass was celebrated at St. Ambrose Catholic Church. He is buried in the Holy Sepulchre Cemetery. His remaining collection of coins was sold posthumously by his estate through Lester Merkin on November 20, 1968. George J. Bauer was inducted into the ANA Numismatic Hall of Fame in 1969. 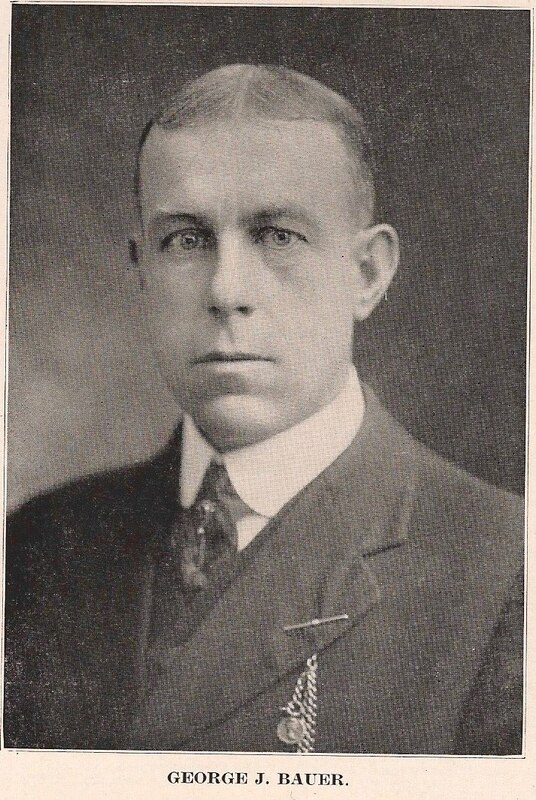 He was also co-founder of various coin clubs at Buffalo (BNA) in 1926, Syracuse, Chautauqua, New York City, and Brooklyn. He was a charter member of the Rochester Kiwanis Club and a member of St. Mauritius Commandery, Knights of St. John and the Rochester Lodge of Elks. He was survived by his sons, five grandchildren and eleven great grandchildren. His son Edward G. Bauer became a stamp and coin dealer at Franklin Stamp Company, 71 Main Street and also at 225 Franklin Street, Rochester, New York, also, and retired in 1982. “A Few Fine Coins of Ancient Greece,” The Numismatist, Vol. 7, No. 6, June (1894) : 109-110. Special thanks to Nicholas M. Graver of the Rochester Numismatic Association for his generously giving me a copy of Scott Fybush's, Rochester Numismatic Association Centennial Banquet January 4, 2012, in order to assist me in my research. Thank you Nick! The Curiosity World, Vol. II, No. 1, November 1 (1887) : front page column 1 ad. The Numismatist, Vol. 4, No. 4, April (1892) : 63; No. 5, May (1892) : 77, 85; Vol. 8, No. 1, January (1895) : 26; Numismatist, Vol. 8, No. 1, January (1895) :  column two bottom display ad. 1910 U. S. Census - Rochester, N.Y.
1920 U. S. Census - Rochester, N.Y.
1930 U. S. Census - Rochester, N.Y.
1940 U. S. Census - Rochester, N.Y.
Scott Fybush, Rochester Numismatic Association Centennial Banquet January 4, 2012.